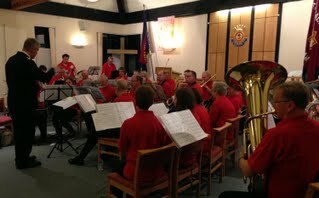 The people of Horsham Corps were fortunate to receive a return visit from the Salvation Army Symphonic Wind Ensemble (SAWSE), under the direction of Musical Director Andrew Mackereth, for a program of music and witness on 5 October 2013. Under the theme “God on Our Side”, SASWE presented an evening of contrasting musical arrangements, closing with Let the Children Sing!, an arrangement by Andrew Mackereth of the music of the late Alan Laken. Laken was a founding member of the ensemble and had family ties to Horsham. The Bible message, given by Peter Bale, brought together thoughts from the words associated with the music. The focus was on how God reveals Himself to be alongside us and helps us to overcome even when challenges seem insuperable. Congregational singing with the rousing accompaniment provided by SASWE was highly enjoyable. The audience also appreciated the relaxed, entertaining style of MD Mackereth, who was an excellent compère. Words of thanks were given by the Horsham band leader, Mervyn Tarrant, who confessed that, as a “dyed-in-the-wool” brass band enthusiast, his expectations of the evening had not been high. Tarrant is now a complete convert to the excellent witness and enjoyment provided by the arrangements for woodwinds and brass performed by the SASWE to such a high standard. This article was posted in News and tagged Alan Laken, Andrew Mackereth, concert, Horsham, Horsham Corps, Isobel McFarlane, Mervyn Tarrant, Peter Bale, Salvation Army Symphonic Wind Ensemble, West Sussex on 3 November 2013 .